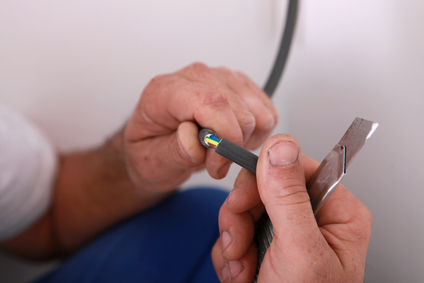 Wire damage and/or faulty wiring can present itself in a variety of hazardous or aggravating ways. The qualified technicians at Sure Line Electric Group have years of experience troubleshooting and applying long-term solutins to all of your electrical wiring problems. You should never attempt to apply amateur or do-it-yourself solutions to involved wiring problems or even when improving antiquated wiring schemes. Our professional electricians will solve both your immediate problem and apply forward thinking strategies to ensure your safety for years to come. One of the most common sources of electrically induced fires is undoubtedly overlamping. Essentially this wiring problem presents itself when a bulb is used with a wattage much higher than the fixutre supporting it, causing "overarching" to occur between wires where electricity jumps from one exposed wire to another. In some older wiring schemes for Long Island homes, stray current was not properly accounted for, making outlets that use adapters for three prong connections potential fire or shock hazards. Though the risk is somewhat negligible for two prong connectors, it is all too easy to overlook the fact that this can take place and have horrible consequences for any device you are plugging in as well as your health. In older homes especially, it is very common to see panels that contain more circuits than they are initially prepared to handle. Though the actual risk associated with such panel configurations is not substantial, the code violation associated with such a problem can cause your to fail inspection. Have you ever had an outlet that your plugs generally fall from as if they are fitting too loosely? This can be a serious problem again producing "overarching," a serious safety hazard. If you are looking for wire repairs in Long Island, then give us a call today at (631) 240-9663 or complete our request service form.